Mazda Press & Awards @ Pacific Mazda Victoria Dealer BC. 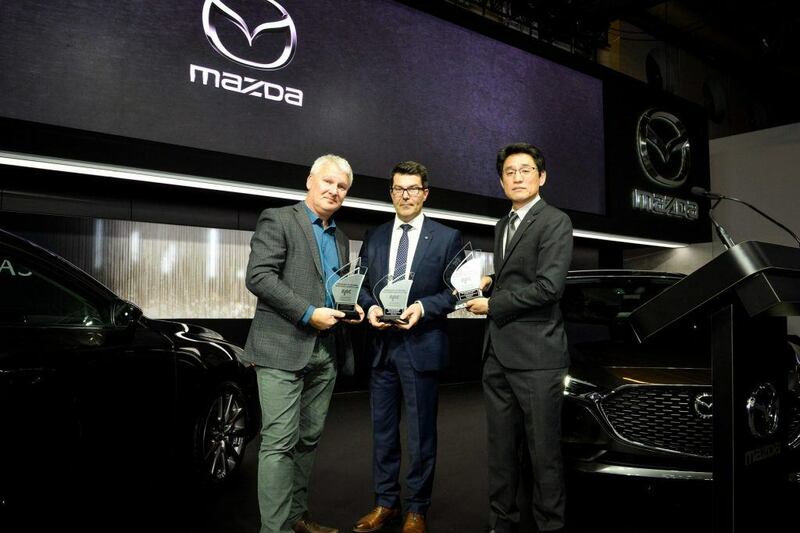 Massey Kondo, President, Mazda Canada, and Jacques Parent, Quebec Regional Manager, Mazda Canada, accept three AJAC awards from Mark Richardson, President, AJAC (CNW Group/Mazda Canada Inc.)MONTREAL, Jan. 17, 2019 /CNW/ - Today at the Montreal International Auto Show media preview, Mazda Canada Inc. accepted three awards from the Automobile Journalists Association of Canada (AJAC) for winning their overall categories. The MX-5 was awarded Best Sports-Performance Car, while the CX-5 took the award for Best Mid-Size Utility Vehicle, and the CX-9 was named Best Large Utility Vehicle. These awards make the MX-5 eligible to win the overall 2019 Canadian Car of the Year award, and the CX-5 and CX-9 are on the shortlist to win the Canadian Utility Vehicle of the Year for 2019. AJAC's 2018 Best Small Utility, the Mazda CX-5 compact crossover, returns to take the top spot once again, winning the recently-renamed category, 2019 Best Mid-Size Utility. The 2018 CX-5 took a comprehensive package and introduced updates to both 2.0L and 2.5L engines which reduced internal friction, increasing low-end torque and reducing real-world fuel consumption. The 2.5L Skyactiv-G engine also introduced cylinder-deactivation to further enhance fuel economy with gains of up to 20 percent improvements at city speeds, and approximately 5 percent on the highway. The 2019 CX-5 (not yet available for testing for these awards) ups the performance envelope with the introduction of the Skyactiv-G 2.5T, a turbocharged engine producing 250 horsepower and 310 lb-ft of torque at just 2,000 RPM. A new Signature trim adds a higher level of sophistication with authentic materials used in the cabin, such as Cocoa Nappa leather, and real Abachi wood trim throughout the interior. The all-new Mazda3 adopts Mazda's new Skyactiv-Vehicle Architecture, designed to enable people to make the most of their natural sense of balance. The powertrain lineup comprises the latest Skyactiv-X, Skyactiv-G and Skyactiv-D engines3, each of which provides responsive speed control in any driving situation. Based on its philosophy of designing the car around the human being, Mazda has dramatically enhanced the car's fundamental driving attributes such that accelerating, turning and braking feel completely natural. Having sold over 6 million units2 since its 2003 debut, the all-new Mazda3 is a global strategic model that has driven Mazda's growth from both a brand and business perspective. It has delivered Mazda's renowned driving pleasure to customers all over the world and been a mainstay of production at key plants globally. "The all-new Mazda3 we unveil today begins a new era for Mazda," said Akira Marumoto, Mazda's Representative Director, President and CEO. "The next generation of Mazda cars will enhance the value of the car-ownership experience. Though these products, we will further raise Mazda's brand value and work towards our goal of building strong bonds with customers all over the world."